It’s been three years, and Zach Dean says he’s learning as much from his students as they are from him. “They teach me stuff every day,” he says. “There’s always a different problem to work through because nobody has the same problems. It’s always really challenging.” That’s understandable, considering that Dean and the other instructors teach the main processes of welding – from safety and blueprints, to SMAW, GMAW, GPAW and more. 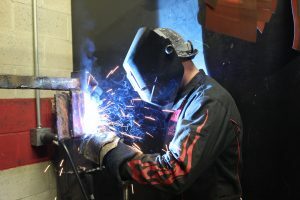 Penn Commercial’s welding program lasts for a year, which Dean says is beneficial. “They can learn pretty much everything they need to.” The training is focused, geared specifically to the welding industry. That means students don’t need to take courses that are not necessary, like history or literature – the general education classes that would be required in a four-year school. With small class sizes, usually limited to fewer than 10 students, Penn can offer more personalized instruction. “We can spend a lot of time with them and help them achieve their goals,” Dean says. By the time students complete their welding instruction, they’re ready for entry-level positions. First, though, they need to certify. “We actually do it in house. We have a third-party company come in, and they do all their qualifications,” Dean says. “They have an x-ray lab about an hour up the road, so students know within about two or three days whether or not they have passed.” For those who pass, the job outlook is promising. “There’s always a need for welders in Pennsylvania in this area,” Dean says. Companies occasionally come to the school looking for welders. “They say, ‘We can’t find enough welders that want to come to work.’” According to O*NET Online, Pennsylvania ranks third in the U.S. for welding jobs – behind only Texas and California – and jobs are expected to increase 6 percent through 2026. 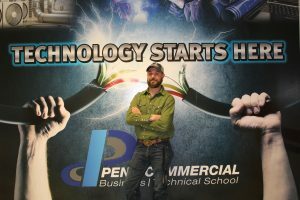 The welding technology program at Penn Commercial focuses on developing hands-on skills in layout and fitting that prepare you for entry-level positions. You can then take the basic welding practices and principles that you learn in pipe welding (ASME IX), stick plate welding (AWS D1.1),flux core welding (AWS D1.1 plate/flux core), mig welding (GMAW AWS d1.1 plate) and stick on pipe (API 1104 6G) and build on them throughout your career. Your training involves a balance of classroom lessons and hands-on instruction by industry professionals at Penn Commercial’s on-site welding facilities. In just one year, you can be ready to go out into the workforce as a professional welder. Classes are forming now and offer flexible day and evening class options. Call Penn Commercial today and start training for an in-demand welding career.